Art Harman, the Director of the Coalition to Save Manned Space Exploration met recently with the White House officials involved in setting the Trump administration's space policy. 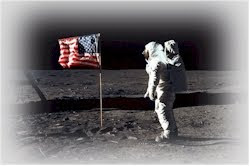 Mr. Harman presented the organization's landmark paper, "A Space Program Worthy of the United States," which is a 19-point plan to rebuild America's space program and actually land Americans on the moon and Mars in the near future, as well as to not allow China and other nations to overtake the U.S. The meeting was very useful and the administration is seeking new ideas and advice. At present, the administration is preparing its plans to refocus NASA's priorities, and many observers expect a greater focus on deep space exploration and commercial partnerships. The Coalition is in continuing contact with the administration and Congress to help assure we will remain the leader in the world for space exploration and high technology, and will in fact return to the Moon and go to Mars--sooner than many believe possible. Art Harman, the Director of the Coalition to Save Manned Space Exploration, participated in a massive Congressional lobbying campaign over two days with volunteer space advocates from around the country, and members of many space advocacy organizations. This was the annual Space Exploration Alliance's "Legislative Blitz," which this year met with staff and members of Congress in over 175 offices. You can help too! Call your Senators and Representative, and ask that they support a bold new space program, and the funding to support it. Call 202-224-3121, and when you reach your Senators' and Representative's offices, ask for the Legislative Assistant that handles NASA so you are talking with the staffer responsible for that issue. Now that we have a president that is more friendly to the space program, it is vital to build greater support in Congress for a return to the moon and a true roadmap to Mars. Congress has already passed the NASA Transition Authorization Act this year, which offers good guidance for NASA in restoring our space program to greatness.